Google has confirmed that the Google core algorithm update that we named the Medic Update is now fully rolled out. 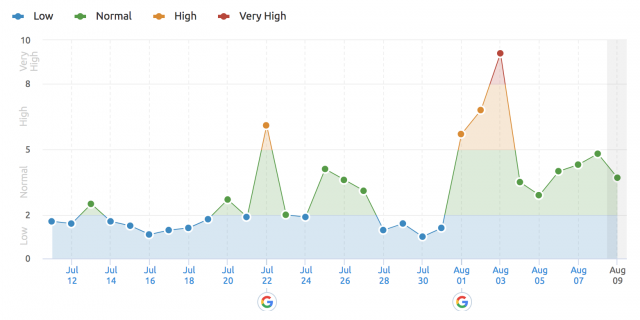 But the SEO community noticed a lot of fluctuations and ranking changes yesterday as well. Danny Sullivan confirmed on Twitter for me that the update is complete, despite the industry noticing a lot of fluctuations in the Google search results yesterday. Danny said the broad August 1st algorithm update is done but "that said, we always have changes that happen, both broad and more specific." There was indeed significant chatter yesterday around an update or more fluctuations starting late August 7th through August 8th. I believe some of that chatter died down but here is some of the quotes from WebmasterWorld and Black Hat World. My traffic dropped 70% today. Its all over. So after a few days whereby traffic and conversions recovered a bit for me , yesterday and today it has fallen off a cliff again. There seems to be another update now rolling out. It comes again after a lull. SERPs volatility up again across all categories. I believe the new chatter has died down a bit this morning, so it is not 100% clear what happened over August 7th and 8th.